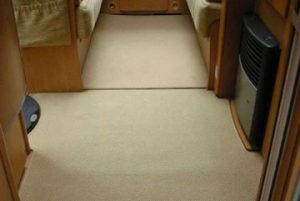 This article describes the installation of electric underfloor heating to the main living area of a Buccaneer Caravel. 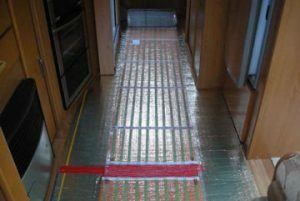 The article is not to be construed as a guide or recommended procedure for the installation of an electric underfloor heating system, but simply intended as a journal of my experience of fitting a system to my own caravan. If you are planning your own installation of any kind, the manufacturer’s procedures and legislative requirements must be adhered to at all times. The floor width varies from 0.75 metres between the bench seats, to 1.3 metres between the entrance door and the fixed furniture opposite, with a length of 4 metres. The mats are supplied with approximately 3m of wire for connection to supply the circuit, and it is necessary to establish the best position for the switch before fixing the mat(s). 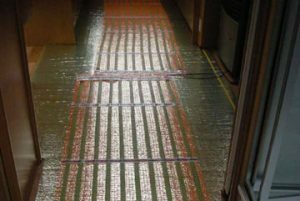 Amorphous metal ribbon heating mats are normally supplied in 0.5m width up to 10m long in increments of 0.5m. Two heat outputs are available 120Watts/m2 and 150Watts/m2. We chose a 0.5m x 4.0m mat with a heat output of 150W/m2 giving a total heat output of 300Watts. The mats are supplied with sticky tape to the underside so they can be fixed directly to the vinyl (or direct onto the plywood) floor. I chose to use a reflective underlay (3mm thick felt with a reflective foil top, normally used under laminate flooring) and to stick the mat to the foil top. I used two loose fit carpets as the template for the shape of the underlay. 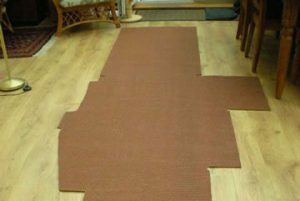 Step one – With the underlay fitted, the mat was laid out centrally along the length of the underlay. When I was satisfied with the position, I stuck it to the foil face. Step two – I laid cables along the floor outside of the mats to the location of the connection point. Step three – Next I made a temporary connection to allow the mat to heat up for a short period (i.e., 5 minutes). This was to test that it worked, and to help it to lay flat. Step four – Using the same two loose lay mats as templates, I cut the earth net to shape and installed it on top of the heating mat. Step five – I attached the earth cable at a suitable location and laid it so that it followed the other two cables. I then taped all 3 cables into place. Step six – Using the same two loose mats as a template, the low tog carpet underlay was cut to shape and placed waffle-face down on top of the earth net. Step seven – At this stage, because the upper surface of the low tog underlay was beige coloured Hessian, the loose lay carpets could be placed into position without looking out of place. However, we decided that the carpet was to be fully fitted. We therefore cut the carpet to shape and fitted it using the two loose lay mats as a template. Step eight – We connected the 3 cables into the 13 Amp plug fitted with 3 Amp fuse, then commissioned the system. We chose not to install a thermostat because the heat output was not great; if the room became too hot we would either open a roof vent or switch off the heating. Installing a thermostat would have greatly complicated the proceedings, and the installation cost would have doubled. In a previous installation to a Bessacarr Cameo 500GLD, I installed an impervious barrier between the low tog carpet underlay and the fully fitted carpet as an added precaution in case of liquid spills. However, experience showed that this was not needed, so we decided not to install it in this project. I intend to install a 3 Amp fused spur with neon tell tale to match the existing electrical fittings but at the present time there is a shortage of CEB fittings. I have scoured the internet and my local leisure outlets; however I still am unable to locate the three components necessary to complete the installation. Therefore, for the time being, we continue to operate via a 13 Amp plug, fused for 3 Amp. This installation can be operated for up to 4 hours via an inverter from a 110AH leisure battery before the inverter cuts out due to low battery voltage. As I have 3 such batteries and my 120Watt solar panel, we have the potential to use the underfloor heating when off EHU and without the need to use the generator. Our experience has been that underfloor heating creates such cosiness that we only need to supplement using the OE heating system(s) during extreme cold snaps. In fact our caravan became the meeting place of choice during rallies in the cooler season. Case study kindly supplied by Superpete.